I have many stellar qualities (at least that’s what my mom keeps telling me) but keeping track of what I need to do has always been more than I can expect from my feeble mind. Luckily, I’ve been using Hog Bay Software’s TaskPaper as an external brain for...er, I can't remember exactly how long, but a good long while. 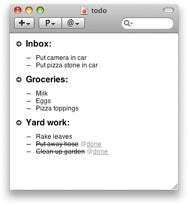 TaskPaper is a simple task management application that casts off the strictures of Getting Things Done and helps you focus on, well, getting things done (notice the lack of capitalization). TaskPaper 2.0 has just been released and it brings with it a slew of new features and UI niceties, including an overhauled search feature, the addition of themes (so now you can manage your tasks with a little more pizzaz), and a Quick Entry window that you can summon via a hot key, allowing you to add tasks to your projects no matter what you're doing on your Mac. But the real magic of TaskPaper, if you ask me, is the file format it uses: text. That’s right, TaskPaper files are just specially formated text files which are editable in any text editor on any platform. Neat, huh? TaskPaper 2.0 is available now for $29.95, and is a free upgrade for anyone with a 1.0 license. Check out the 10 minute screencast for a great overview of how the app works, and why it's worth your hard-earned cash.